A few things from the collection caught my eye but I didn't want to waste money buying the whole collection so I only have a few things to review.... As you can see, the stand only had one tester available and that was just the blush. No wonder the Essence stands are always wrecked as it's so tempting for people to open the new stuff to test! 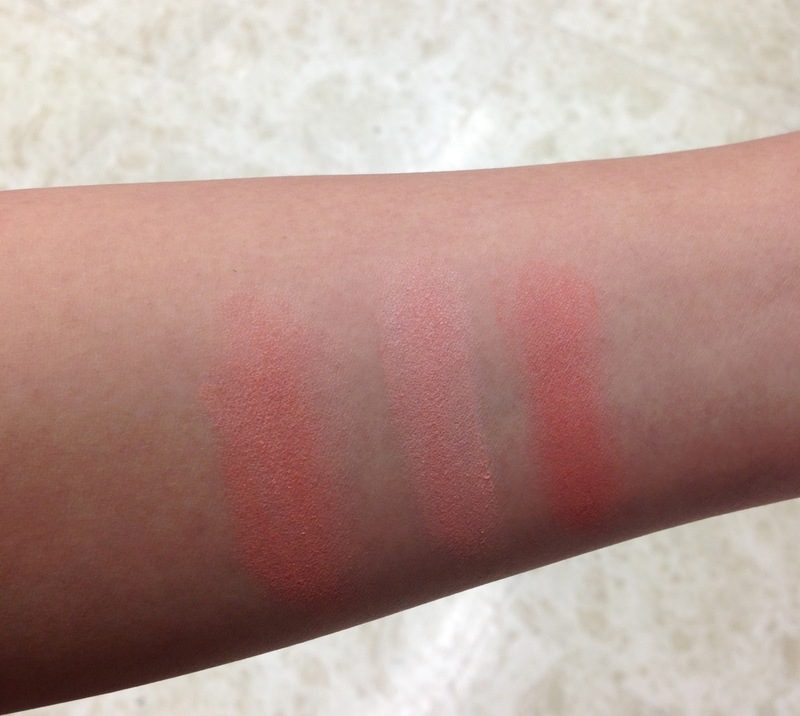 The left swatch is what the blush looks like when it's blended together. The middle one is a light pink (right hand side of the blush) and the far right is the orangey-apricot (left hand side of the blush). It's a very sheer blush and I had to layer it on really thickly. I think that the lipstick pencil might improve if I put it in the fridge to harden up as it currently feels like I'm rubbing wax or animal fat on my lips when I use this... Avoid this lipstick pencil like the plague! Did they not test these on people before they released them?! Holy smokes! This polish really blew me away! It took 2 thin coats for it to become opaque and it's a orangey-apricot colour. It's definitely a colour that I could wear all summer :) The thing that blew me away about it was that it dries SO FREAKING FAST! I hate painting my nails as I'm too impatient to wait for it to dry but this one dried in a matter of minutes. I put one coat on, took a few photos, came back to put another coat on, read a few blog posts and it was dry... like so dry that my finger didn't leave a finger print on the polish!!!! And I didn't even use a base or top coat!!! (I was in too much of a hurry to get the photos done while the sun was still up). 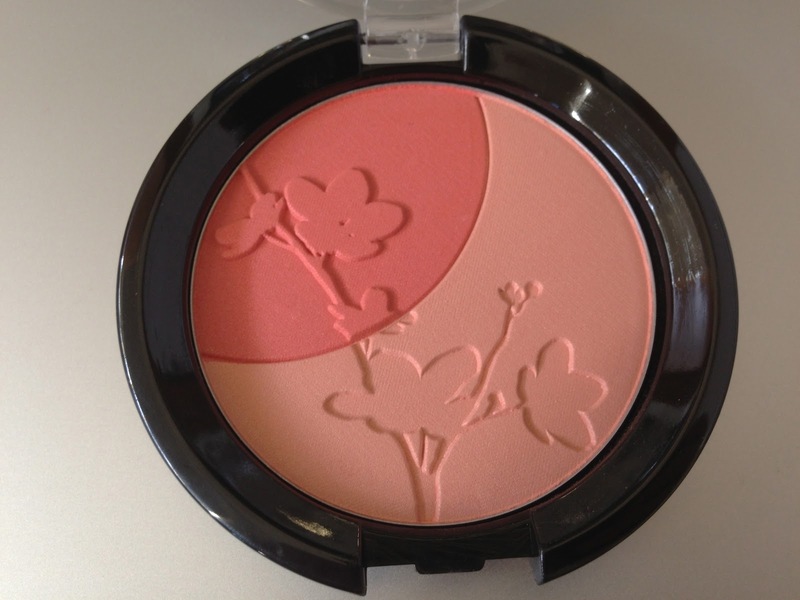 That blush looks really nice! I'm not supposed to be buying anything but I really want a peachy blush and Essence is cheap enough to justify it. Pitty it's a bit sheer. I haven't tried their nail polishes but looks like I should. I like their eyeshadows, in particular their quattro palette in To Die For. btw whats the cherry blossom girl thing? 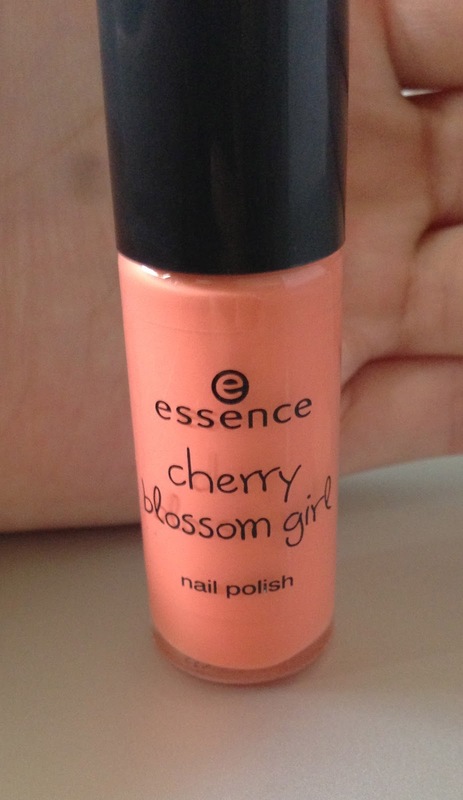 Are you asking about why cherry blossom girl is written on all the products? It's the cherry blossom collection. I thought this collection was going to be amazing, but I've read a couple of reviews and since discovered that the lip pencils are horrible, which is a real disappointment. At least the polishes save it! The lip pencils are ridiculously horrible.. I really hate mine and I really do think that I'll be returning the 2 that I bought for a swap. I'd be ashamed to send them to her! I'm impressed that the polish dried so fast! I'm really disappointed that the lip pencils are a bust! I love the polish so much right now! I got a few things from this collection today, the blush, highlighters, the eye shadow quad and the nail polishes. I didn't get the lip pencils as Kate from labeauteleblogeur posted about them yesterday and said they were awful! Yep.. I refunded the 2 that I bought for a swap as they were horrible. I have no idea what to do with the one that I have now.. it's probably going to meet its end in the bin. Same. Essence isn't my favourite brand or my go to brand. I'd prefer to spend a few dollars more on Australis or Face of Australia if I wanted something drugstore and budget friendly. Oh my gosh I just read a review about these products and was hoping it'd hit priceline or target soon! I'm definitely going to keep an eye out for this stand now - I want all the polishes! I had no idea when these were being released but now I totally have to go to Priceline. I hope there's still some things left! Hopefully there's still some polishes and blushes left for you :) I think that they're the highlight of the collection. That's an amazing shade for the polish! I might just grab one for myself this weekend! I really like this shade :) It's perfect for summer! i haven't try any Essence products yet but i hear great reviews for the eyeliner pots from the regular line! they compare them with Mac's! I've heard that too! But I already have the MAC one so I don't need the Essence one.